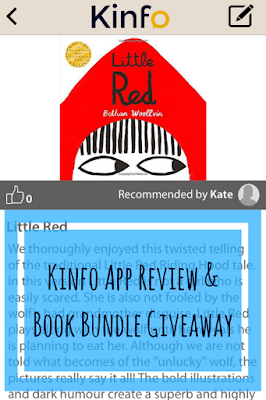 KINFO is a new FREE app available on the App Store in iOS (an Android version is in development). The app has been designed by Isabelle, a mum of three, to help other parents find great activities for their own children. There is no sponsored content, all the recommendations have been added by parents. 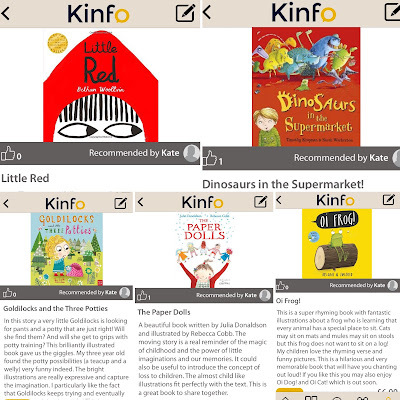 On KINFO you will find fantastic ideas for days out, holidays, recipes, games and crafts. As well as reviews of brilliant films, toys and of course, BOOKS! I downloaded the free app to my iPhone from the App Store without any issues. I then added my details to complete registration and had a go at navigating the app. I found the app really straightforward to use, as there are different categories to help you find what you are looking for and there is also a search facility. I went to the BOOKS category and, although the app is still relatively new, there were already some fantastic book reviews. I browsed the reviews and "liked" the ones that we also enjoyed. I was also able to follow the users whose recommendations I liked. I then added some book recommendations of my own. This was really simple to do. I just typed in the title and it came up with a stock picture and some basic information about the book. I then edited the text to include why my children enjoyed the book and hit publish - that was it! Overall I found KINFO to be very user friendly and great to have on my phone! I really like that all the content has been added by other parents as browsing the recommendations, I felt that the information was more likely to be reliable than sponsored content. I'm sure KINFO is going to be particularly helpful during the school holidays! I recommended five of the Mini Reviewers' all time favourite books on KINFO and you could win copies of all five books by entering our giveaway. The titles included in the prize bundle are: Little Red; Dinosaurs in the Supermarket; Goldilocks and The Three Potties; The Paper Dolls and Oi Frog. *This is a sponsored post. However, all opinions are as always our own. Love the sound of this app and like that it comes from real parents views too. Will check out. The Paper dolls, my daughter got it out the library and she loved it! Goldilocks and the three potties sounds appropriate right about now. Sounds like a great idea for an app. 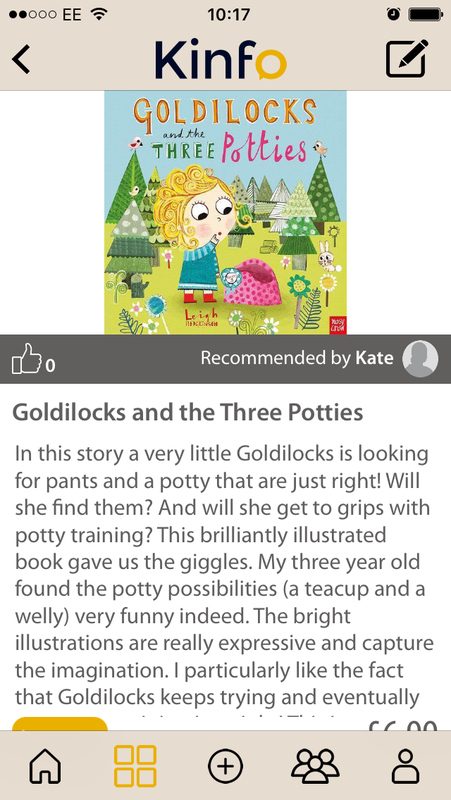 There are lots of lovely books for kids out there, it's great to get real reviews from parents. Thanks for linking up at #KCACOLS. Hope you come back again next time. This looks like a great app, especially as it's the reviews and recommendations of parents :) I'll have to check it out!